Let’s all stand and applaud ‘Lu’s hands’. 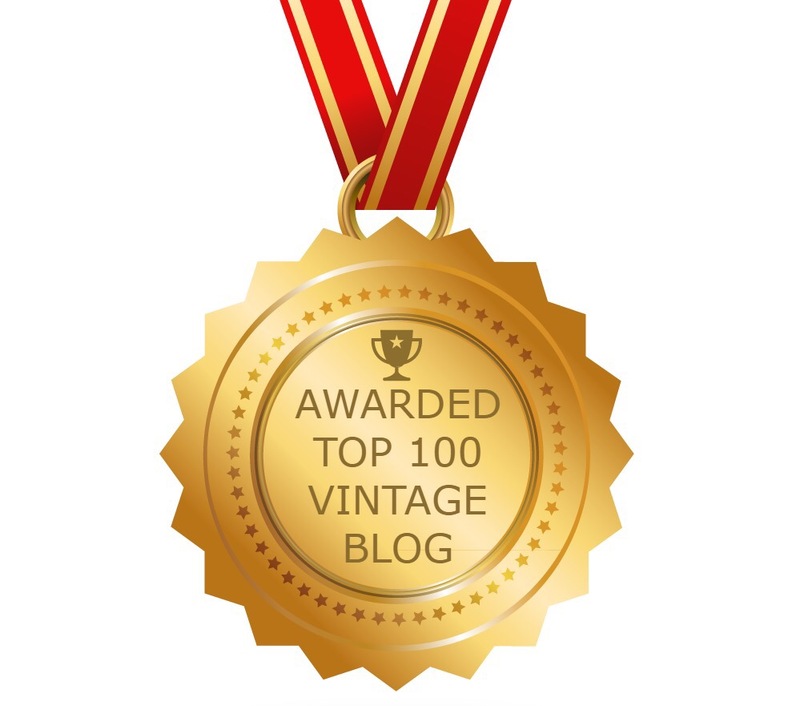 Welcome to my latest blog post collaboration; and one in which I have ventured outside of my usual ‘comfort zone’ of retro and vintage fashion. Although I am tentatively treading new pastures I am nevertheless excited to be able to chat with Lucia of ‘Lu’s hands’. Thank you for talking with @Rations2R_n_R. 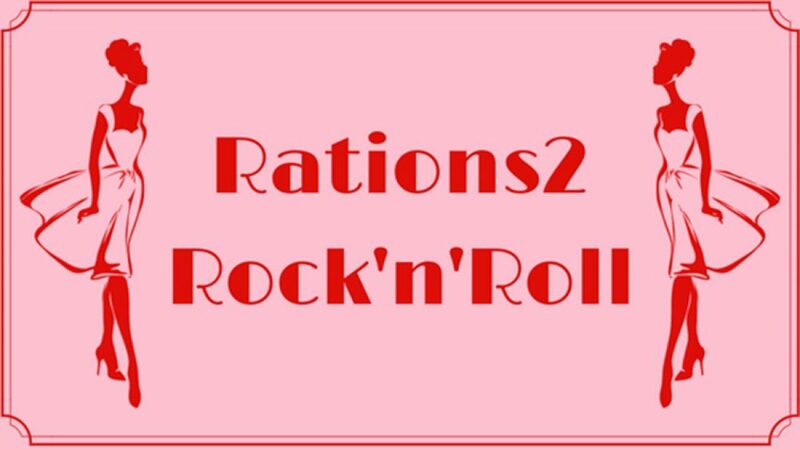 @Rations2R_n_R (C) I would like you to introduce yourself and tell our readers a little about the woman responsible for ‘Lu’s hands’. Lu’s hands (L) Hi! My name is Lucia, and I am a flower whisperer and plant lover. 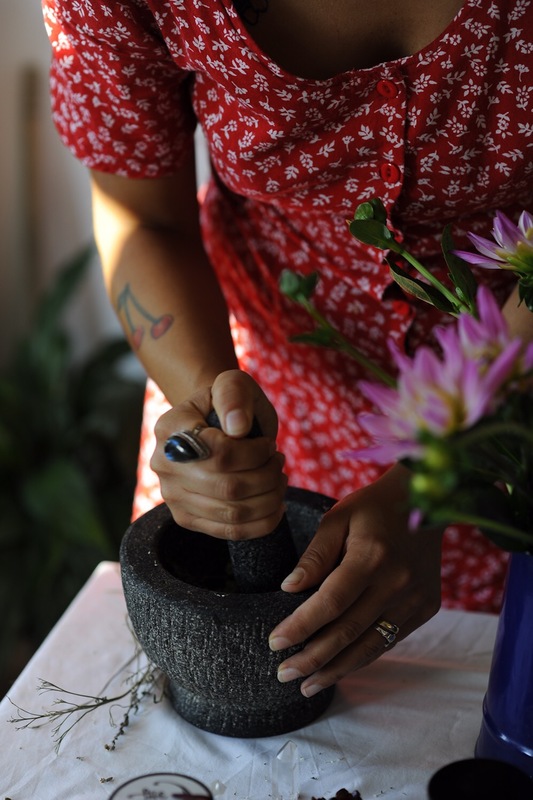 I have been passionate about natural skin care, home made grandma remedies and traditional beauty recipes since forever. I have been a traditional skin care beauty recipe book collector, and herbal skin care maker for the past 10 years. The thought of opening an actual shop only came afterwards, a couple of years ago when I decided to share my passion and love for Nature and all it’s inhabitants (that includes us of course)! I wanted to share a new concept of beauty, enclosed in Lu’s hands, as I wrote in my shop: “Lu’s hands contains ancient beauty formulas, it helps especially women, of all ages, encloses recipes that follow the old ways of green alchemy, formulas with which I want to transport you to a new concept of beauty, perceived like a ritual for the health and well being of the body, where we treat ourselves like real goddesses”! (C) I see that ‘Lu’s hands’ provides hand crafted herbal beauty goods. Please tell us more. (L) I’m very happy to share about my products, as often a picture can’t really speak for all the intention and devotion that goes on behind the scenes. My beauty goods are all handmade following the according moon phases, in the heart of my home, which is my kitchen. Everything is made using organic / ethical ingredients from small farmers around the world. It is a ritual for me to make them. I always make sure I have an herbal infusion for myself brewing, a candle, and an herbal incense that I crafted or an herbal smudge going, and soft music playing. I make almost everything intuitively and almost never write any recipes down. I infuse the herbs in oil on a new Moon, and then I strain it 6 weeks later if I’m satisfied with it, or sometimes I leave it longer. Then I mix it with infused floral waters and organic essential oils where needed. I also use gemstone infusions and flower essences, crafted by me and infused according to specific Sun or Moon influences. 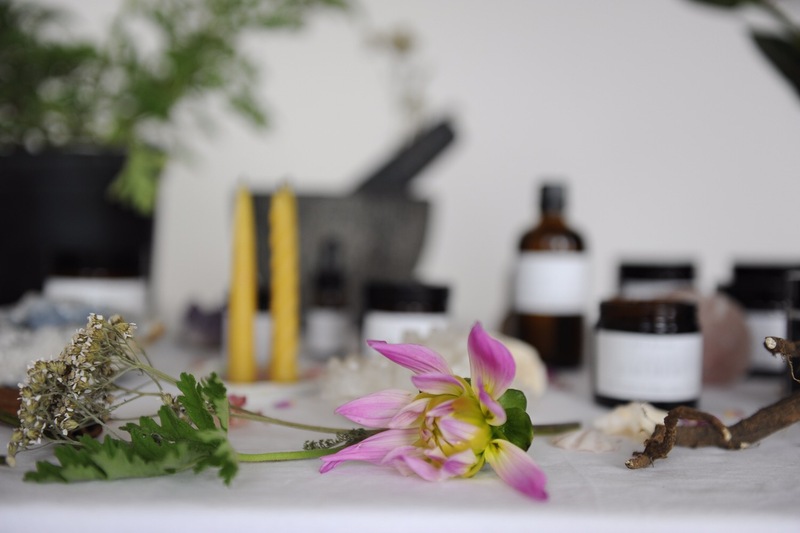 I’m a Reiki practitioner and I notice the difference it makes when I’m working with herbs, the products are infused with that too and it’s very cleansing. (C) You like to go out with your foraging basket and I would like to hear more about this. (L) Living and working in London, yearning for a garden, makes me wander around with my basket a lot. It started as a passion to identify different plants and weeds and their medicinal properties, and then I discovered that even when living in a city, you can still work with herbs, and see all the medicinal herbs that grow around you. Actually these plants that grow closest to you are often all the medicine that you need. I make sure I forage following the guidelines and ethics in UK. I DON’T FORAGE TO MAKE PRODUCTS I SELL. I do it just for my personal use and if a herb is abundant. I do it mainly for weeds and fruits which are abundant and mostly on the floor, because unfortunately the majority of people living in the city are quite disconnected from nature and its surroundings. I work in a garden once a week, where I see plenty of medicinal herbs and fruit trees completely untouched, and it’s the same people who have bay leaves in their garden who buy bay leaves in the shop wrapped in plastic! (C) You say that you do not want to be “…one of the thousand companies that rip the planet of it’s nutrients…and want to have full control on what type of ingredients are in each and everyone of your products”. You have an obvious passion that I would like you to share with us. (L) Yes. It’s difficult to explain and probably difficult to understand, but we live in a disconnected society where we are pushed to behave a certain way, to produce, to take advantage. I look at Nature and I see the example in the plants of how I’d like to live. Nothing in nature behaves like we do, why is that? I‘m trying to discover it as I go along. It’s very important to me to know where things are coming from, who made it, and under what circumstances. I don’t use any chemicals in my products and it depends on the item, but obviously some of them have a limited shelf life. Whilst salves, tinctures and infused oils have a naturally longer shelf life, there are some items that I make, which are fresh, like shampoo or face creams which have a shorter life. And that’s normal if you make natural skin care. 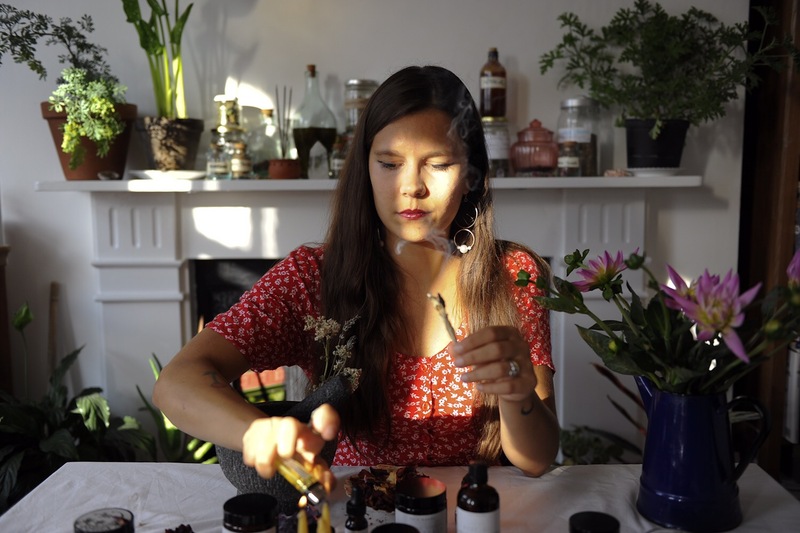 I’m sticking to the easy principle of ‘don’t put on your face what you wouldn’t eat’, and I have a funny story about that which I can share with you… Sometime ago I made a deodorant with Patchouli for my dad – he loves patchouli and I made it for his birthday. It was very hot in south Italy where I’m from and so he put it in the fridge. He was living with two old nearly blind aunties of his girlfriend at the time and the next day when he went to take some deodorant after his shower, he saw that it was gone! He then investigated in the house and he found out that the old aunties ate it on some sourdough bread! He was rather upset, but I couldn’t stop laughing when he told me that. This just explains how natural my products are. (C) I am interested in the process to transform raw ingredients into a finished beauty product. Please tell us about your ‘Natural toothpaste’. (L) There are a variety of toothpastes around, natural and unnatural – some people say that you can just wash them with coconut oil if you like, while others are too used to their chemical toothpaste to even adventure in a natural one. My particular toothpaste is made with a percentage of raw coconut oil and clay, with refreshing and cleansing essential oils of peppermint and tea tree. I love to work with pure raw extra virgin or virgin ingredients. They hold a special energy to them, they are really strong and need to be used with the right moderation and dilution. I love to slowly infuse herbs in honey, oil, or vinegar using the longer method. There are some products like face creams or butters, where they call for the impossible mix between water and oil. I really feel like I’m making magic sometimes! Watching the colour of the waters and oils changing and merging with the colour of the plants, golden oils melted with beeswax and cocoa butter that smells like honey and chocolate, vanilla sugar scrub with orange zest. It’s just heavenly delicious, and my tiny home smells a mixture between spring flowers and moss. (C) I am sure that our readers would like to also know more about your ‘Mermaid bath salts’. (L) I have a deep love for the sea, and I miss it beyond words. Where I’m from in Italy, I used to swim everyday. There is something really special about the energy of the sea and its inhabitants, and I wanted to share all my love in the mermaid bath salts and ‘Song to the Siren’ – a solid perfume I created to go together with the salts to reconnect with the sea spirits. It’s made with a special salt that comes from the coast of France, that is so pure and rich that it’s wet on your hands. It’s mixed with herbs, roots and resins that are ruled by the moon – the one who rules the waters and our inner waters too. 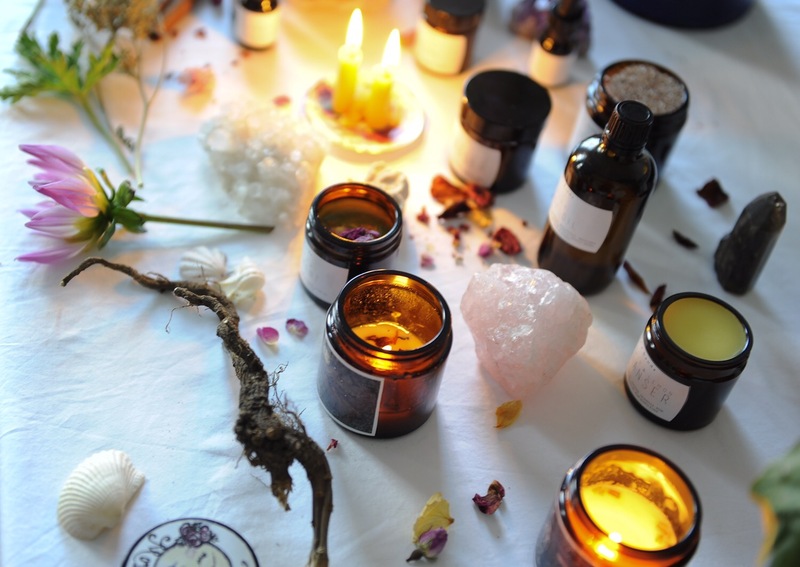 Moon herbs and resins like Jasmine flowers and Myrrh, sea weeds like Dulce and Bladderwrack, and oils infused with Crystals of Aquamarine, green fluorite, Lapiz lazuli and more! They are really special salts and it’s a real treat for yourself or others, I would get them with the song of the siren perfume, for the special mermaids out there! (C) I would like to hear more about some of the other products that are available. (L) There are some essential everyday products from deodorant to shampoo, conditioner and face cream, to herbal salves for pain, relaxation or colds. Flowers and gem essences, a special incense called romance which is very dear to me, solid and oil perfumes, and my most favorite product of all is the Rose syrup. I’m deeply in love with the medicine of rose, it goes hand in hand with being a woman. 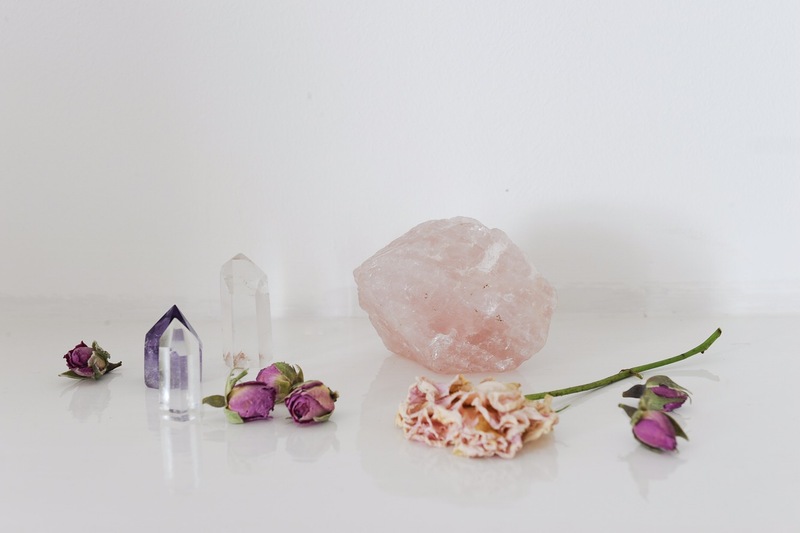 Not only is it a symbol of beauty and eternal love, Rose also has a variety of medicinal benefits for a woman’s body. From regulating hormones, to toning, and aiding in digestion by moving stagnant energy. I also use it if I have a sore throat! My favourite way of using it is probably to take it internally in a syrup form, which emotionally aids in depression and is perfect to bring love back into your life after a loss. It works on the heart and is the heart’s best medicine. (C) Please tell us about sustainability and the ethical and organic nature of your ingredients and, specifically, how you ensure that your suppliers meet your demands. (L) Well I only buy from small farmers that work sustainably. I do my research, I know for example a family business where I buy some of my essential oils, where they talk to the plants – I watched a documentary about them and it felt right to support them. I’m a student of Shamanic homeopathy and my teacher is also an herbalist. He makes all the tinctures and he has a lot of old students and friends that provide him sustainable herbs and oils here in the UK and so I buy from them too. My aromatherapy teacher gives me advice, and I trust my teachers fully. Also by intuition, if something doesn’t feel right I normally stop using it and I look elsewhere. Normally I buy organically or ethically cultivated herbs and carrier oils or butters. Normally I get almost everything at the farmer’s market, and the majority of the things I use are widely available here in UK. I tend not to buy things that are not from the UK, which is local to me. The honey and beeswax are 100 miles from my home, from a small family business that supports the bees. (C) I also like to ask about the women that inspire; either historically, or contemporary. Are there women that have inspired you Lucia? (L) Mmmm that’s a very difficult one! I have many women who inspire me on a daily basis, but lets narrow it down. First and foremost I would say Juliet de Baraicli Levi. If you can, watch the documentary about her life called Juliet of the herbs, I loved it so much I cried. She wrote many many books and I like her traditional approach to herbalism more than many modern approaches which lean more toward quick-fix herbal supplements and pills. Then there is Kate Bush, my absolute favourite artist on the planet, I love her! I find all of her music very inspiring, and I’m often listening to her to get in the right mood before I start to work. I have an obsession! I find her relationship with the natural world very strong and inspiring, and I like how she kept quiet but still created, but at her own pace and without trying to fulfill some big record label company. I adore novels, I read a lot and I have many women who inspire me from book characters. My grandma Lucia, she is my hero and she grows a red rose back garden of untreated roses… I went last May, (the month of the roses there) and it was an absolute dream! Plus she was making herself some rose water, I spotted the petals in a pot in the kitchen. I love her. (C) What is the website address for ‘Lu’s hands’ and where may you be found on Social Media? (L) You can connect with me on Instagram on my personal account @lushandsbeautypotions or my shop account, (still working in progress) @lu_s_handsshop. On my blog, I started to write only recently, http://rosesinajar.blogspot.co.uk/ and it will link you to my facebook page lu’s hands natural potions London, and etsy shop http://www.etsy.com/shop/lushands. I will have an up and running professional website hopefully ready in a few weeks. Thank you Lucia for sharing your passion. It has been both fascinating and deeply informative…with a delightful splash of humour added. I wish you well as Lu’s hands grows and flourishes. Author rations2rocknrollPosted on September 8, 2017 September 8, 2017 Categories Beauty, Beauty Products, Ethics, Homemade, Natural, Nature, Sustainability2 Comments on Let’s all stand and applaud ‘Lu’s hands’.